I try to get my bee commitments finished early in the month. Since there are still a few hours left in the first week of August, I am going to call this month a success. 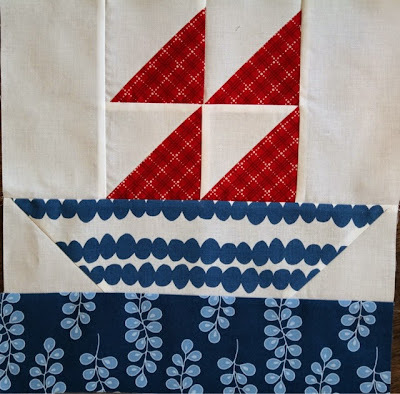 This is the last month in the Modern Stitching Bee. I think it's very appropriate that the last month we are making for the leader of this bee. 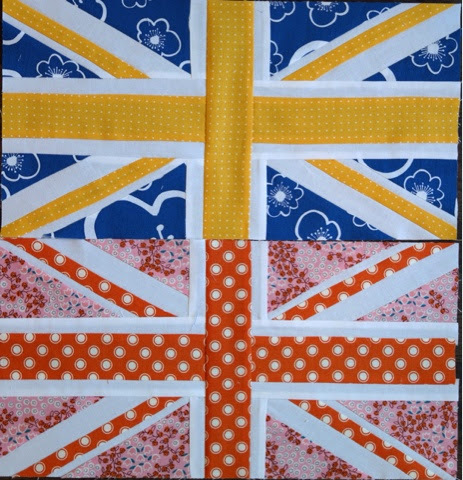 Rhonda has asked for Union Jack blocks in bright colors with Kona White as the background. I had a little trouble with the directions of the stripes, but as always, when you actually READ the directions and follow them, things work out as they are intended to do. This tutorial is by Molli Sparkles and can be found here on his blog. Next up is Angela in the Stitch Tease Bee. She asked for 8 small cross blocks for her medallion quilt that she is working on finishing, using bright colors with scrappy low volume backgrounds. After the cutting, these came together so quickly. I just chain pieced them and had them all sewn up in less than an hour. ANge said she was short on purples and oranges, so I make two of each. I hope the lighter purple is not too light. For do.Good Stitches Dream circle we were asked to make sailboat blocks in red and blue. Straight forward and simple as can be. Now I need to quilt and bind 2 quilts. See you soon with two finishes, fingers crossed. What a nice variety! I really want to try Molli's tutorial one of these days! 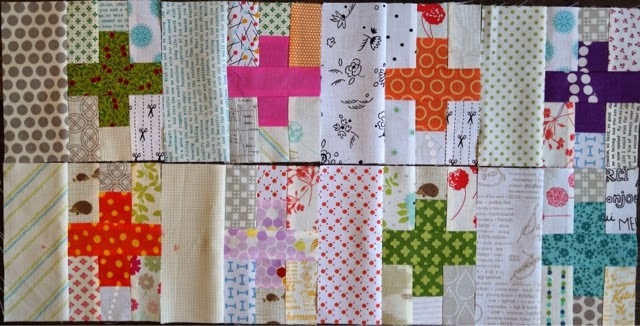 I am hoping to deliver Rhonda's blocks to her in person, so I best get them made. All your blocks are lovely. Impressive! I stopped doing bees and swaps til I retire. Just got so stressful when I was pushing the deadline.